Learn how to become a tutor in the UK and find out about the qualifications, experience and skills you need to join the profession. Editors note: This post has been completely revamped and updated for accuracy as of 23/08/2018. For more insights into how to become a tutor in the UK, or for media enquiries, contact jamiethomson@thetutorwebsite.co.uk. Did you know that according to the Sutton Trust, 25% of UK school children now use private tutors? And that figure increases to 50% in London. Working as a tutor can be a hugely rewarding job, not to mention a great way to earn a living being your own boss. The private tuition industry in the UK is said to be worth £6 billion and is continually growing. If you have a passion for teaching others, then there's never been a better time to consider becoming a tutor. There are no standard qualifications for private tutors in the UK so anyone who has good knowledge in a specialist subject can become a tutor. Private tutoring isn't just limited to teaching school kids either, there are lots of tutors who specialise in teaching music, arts, business, marketing, computer coding and professional services. Generally speaking, private tutors are likely to be seen as valuable in the eyes of a student or parent if they have first-hand experience in the subject they're tutoring. As far as academia goes, qualified teachers often decide to become tutors and offer their services to supplement their full-time teaching job. Newly qualified or retired teachers also offer their services as tutors and are sometimes the preferred choice of educator as their previous experience clearly shows their expertise. A recent study from TES revealed that 74% of tutors had previously worked in teaching. 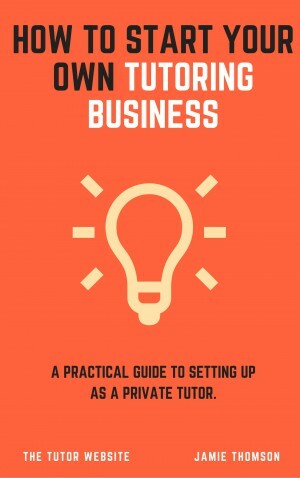 We’ve also published a guide: How to Start Your Own Tutoring Business, which is available to buy exclusively from The Tutor Website. It only costs £21.99 – less than the average tutor charges per hour. On the other hand, many students and parents consciously decide to choose a tutor who isn't a teacher, who may have a slightly different approach to learning. Out with educational establishments, those who tutor in more specialist subjects like online marketing, web development, html coding etc. tend to have experience of working in those specific industries. How qualified these tutors need to be is at the discretion of the student using their services. Note: As of the 17th June 2013, The Criminal Records Bureau (CRB) and the Independent Safeguarding Authority (ISA) have merged into the Disclosure and Barring Service (DBS). As a result of this merge, CRB checks are now called DBS checks. DBS checks are required for certain jobs or voluntary work. For example, someone may need to undergo a DBS check in order to work with children, work in healthcare or to apply to foster or adopt a child. For people wishing to obtain a criminal record check in Scotland, the application process is different and is administered by Disclosure Scotland. In Northern Ireland, applications are overseen by Access Northern Ireland as part of the Department of Justice (NI). There are no legal requirements for tutors to be DBS checked, but it’s worthwhile trying to obtain one, particularly if you plan to tutor students under the age of 18. For more information on DBS checks, please see our page on DBS checks for private tutors. If you're considering becoming a private tutor, it's important to ask yourself if you have the personal qualities needed to work with students. Generally, tutors should be friendly and approachable yet maintain a professionalism that reassures students and parents that they're good at what they do. It's important to have patience and to have a genuine interest in working with younger people or those looking to learn a new skill. If you have the ability to motivate people and approach new challenges with enthusiasm, then working as a private tutor can give you great job satisfaction. Will You Tutor in Your Own Home or Travel? Tutors usually offer their services directly from their own homes or they travel to student’s houses. In some cases, you might teach from a student's workplace or from a public place like a coffee shop or library. Working as a travelling tutor opens up your options in terms of the areas you can cover and it often pays to have the flexibility of working this way. However, you should also consider your travel costs if you decide to be a travelling tutor. Make sure that you’re prepared for those extra overheads such as petrol or public transport costs and consider whether they'll be reflected in how much you charge for your services. Have a think about where will lessons take place. Is there enough space in your home to provide a stimulating learning environment? You should also consider your utility bills and whether the cost of your utilities will increase as a result of your business. If you're a private tenant, you should check if you're permitted to run a small business from your home. Some tenancy agreements have clauses in place that restrict the type of business you can operate. Consider what you'll do about students who cancel at the last minute. Will you decide to use a cancellation policy? Most tutors start out as sole traders and keep their own financial records. A simple income and expenditure spreadsheet should be fine to help you keep track of your earnings. As a sole trader, you'll need to complete a self-assessment tax return every year after the 5th April and the easiest way to do so is online. You have 3 months from when you begin your self-employment to inform HMRC and obtain your Unique Tax Reference (UTR) number. As your business expands, you may wish to consider hiring other people to work for you or you may want to set up your own tuition agency, in which case you'll need to change your legal structure and become a Limited Company. You'll also need to adhere to employment agency law and should seek appropriate advice from relevant qualified bodies. Public liability insurance is generally recommended for anyone who offers tuition out with or within their own home as a means of protecting themselves against legal liability following an injury to a student or damage to third party property. However, public insurance isn’t a legal obligation. Professional Insurance is also considered by some tutors as a means of protection against any legal proceedings as a result of advice or guidance given as a professional service. For more information on whether you need insurance as a private tutor, see our post on insurance for tutors. For more information on how to become a private tutor in the UK, you can buy our guide How to Start Your Own Tutoring Business for £21.99 (less than the average tutor charges per hour). It’s packed with useful advice including how to choose which subjects to tutor, how much to charge, the benefits of tutoring agencies, and how to tutor online.